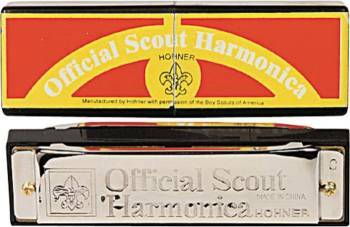 Recognized by the Boy Scouts of America as an official scouting accessory, rich tone, plastic body, 10 single holes and 20 reeds. Key of C.
This book is a complete guide to playing the 10-hole diatonic harmonica. Its purpose is to help the beginning student avoid the trail and error method of playing the harmonica through step-by-step technical instruction and an extensive, graded repertoire. Includes CD and DVD.